28.34cts. 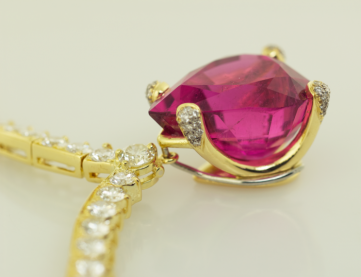 Hot Pink Tourmaline set in 18KT yellow gold with chunky diamond pavé prongs. Tourmaline is another October birthstone. Tourmaline comes in most of the hues of the color wheel. The gem species of tourmaline all share the elements silicon, aluminum, and boron. Tourmaline also contains complex mixtures of other elements such as sodium, lithium, calcium, magnesium, manganese, iron, chromium, vanadium, fluorine, and sometimes copper that cause the different colors. 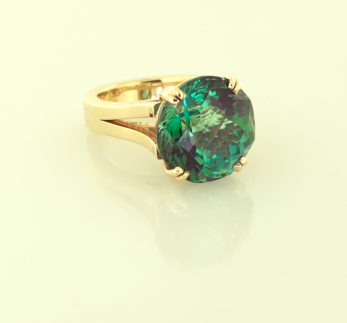 Blue and green tourmaline is determined by traces of iron, and possibly titanium. Manganese produces reds and pinks, and possibly yellows. Some pink and yellow elbaites might owe their hues to color centers caused by radiation, which can be natural or laboratory-induced. The gem species of tourmaline are elbaites, liddicoatite, dravite, uvite and schrol. Elbaites offer the widest range of gem-quality tourmaline colors. They can be green, blue, or yellow, pink to red, colorless, or zoned with a combination of colors. Liddicoatite is rich in calcium, lithium, and aluminum and found in most colors. Gem tourmalines of dravite and uvite species are often brown, yellow, yellowish brown, reddish brown, or nearly black in color, but sometimes they contain traces of vanadium, chromium, or both. Schorl is typically black, and rich in iron. Some varieties of gem tourmaline have their own trade names. Rubellite is a name for pink, red, purplish red, orangey red, or brownish red tourmaline. Indicolite is dark violetish blue, blue, or greenish blue tourmaline. Paraíba is an intense violetish blue, greenish blue, or blue tourmaline from the state of Paraíba, Brazil. Chrome tourmaline is intense green. In spite of its name, it’s colored mostly by vanadium, the same element that colors many Brazilian and African emeralds. Parti-colored tourmaline displays more than one color. One of the most common combinations is green and pink, but many others are possible. Watermelon tourmaline is pink in the center and green around the outside. Crystals of this material are typically cut in slices to display this special arrangement. Tourmaline has been used as a gem for centuries, but was thought to be rubies, sapphires or emeralds depending on its color. Modern mineralogy can now accurately determine a gem’s specie by chemical analysis. One of the earliest reports of tourmaline as a separate specie was in the late 1800’s with the discovery of tourmaline in California. Tourmaline became known as America’s gem with discoveries in both Maine and California. The supply of tourmaline increased dramatically in the first half of the 20th century with discoveries of large deposits in Brazil. Today tourmaline is also mined in Madagascar, Africa, and Afghanistan. Oval Maine Green 1.31ct. 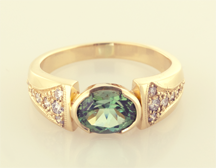 tourmaline bezel set in 14KT yellow gold ring with .33ct. diamond pavé accents. Tourmaline has many mystical powers due to the variety of colors. The red tourmaline are good for attracting love, the greens wealth, the multi color tourmaline bring luck. Any color tourmaline will enhance creativity, promote wisdom and bring peace and tranquility to the wearer. This gem is great for anyone no matter what month your birthday falls.